Kit will tell you that I am relentlessly dogged in my determination to get minute details right whether it be for our house, my job, or graphic design. If I set my mind to something, or become interested in a particular type of building material, I will completely dive down the rabbit hole learning everything I can and digging up any old documentation possible. This has manifested itself in many ways when it comes to our perfect little money pit. So, many things have happened these first few weeks (I started writing this post over two weeks ago…life has been crazy). MPLMP has a full time resident, but it’s not me…and I had some visitors come to study the house in the hopes that I might get it on the National Register of Historic Places. During all of this and to continue on until who knows when, work has begun in earnest on making this perfect little money pit, my perfect little money pit. 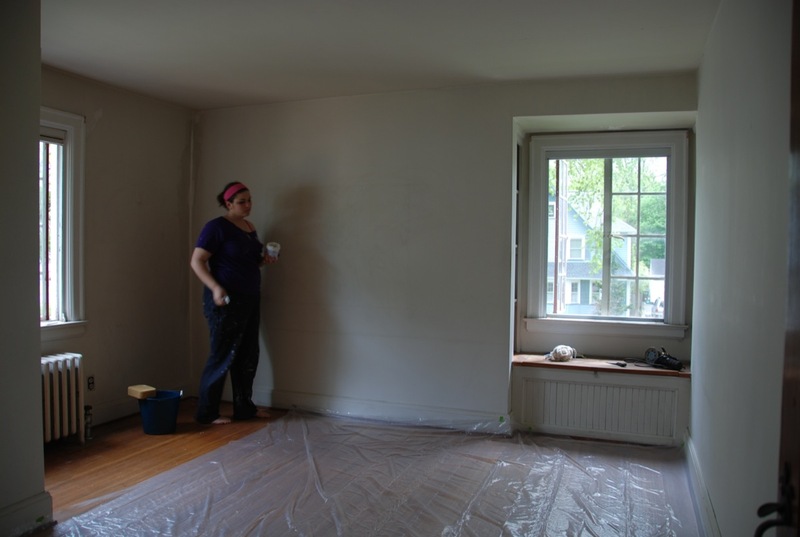 Kit and I, with much appreciated help from MPLMP’s first resident, Joshua (more on him later), have begun the process of repainting all of the rooms of the house. Many of the rooms either feature near colorless beiges, flaking and peeling paint, or just plain dirty old walls in colors I could do without. The first room we decided to tackle was the medium bedroom. Seen here right before we started painting.